CHICAGO – “The Day the Earth Stood Still” is about an alien visitor’s decision to wipe out the human race. And, if an interstellar race actually gets to see this film, it would be hard to blame them for wanting to clean house on planet Earth. The original “Day the Earth Stood Still” was a plea for peace. The film was made shortly after the nuclear bombs were dropped on Japan and it was producer Julian Blaustein’s desire to make a metaphorical sci-fi film that led to one of the most influential movies in the history of the genre. Even with the importance of the original “Day” in mind, there’s absolutely no reason that a modern filmmaker couldn’t make a riveting and contemporary update of its story. We clearly could still use a message of rational thought over reactionary violence, and 57 years is more than enough time to go by before revisiting a film like “The Day the Earth Stood Still”. 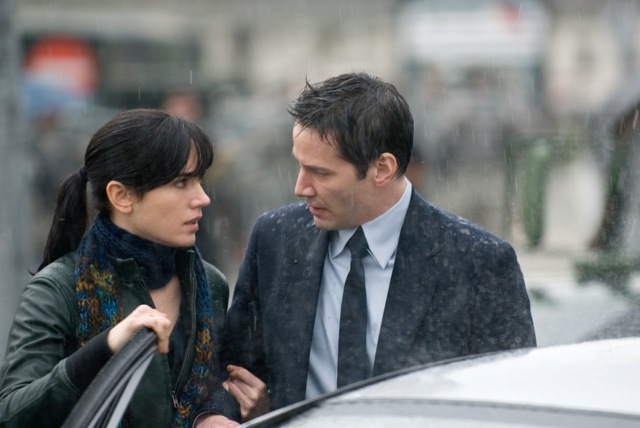 Jennifer Connelly as Dr. Helen Benson and Keanu Reeves as Klaatu in The Day the Earth Stood Still. What’s baffling about this new version of “The Day the Earth Stood Still” is that the filmmakers and producers who “reimagined” (their word, not mine) the original have completely inverted what made the original work. A documentary-style film more concerned with the human race than the alien one visiting it has been turned into a loud, CGI-driven disaster flick where it’s a lot easier to root for the otherworldly visitors than the insufferable humans. 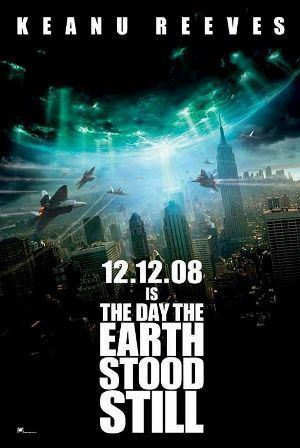 The Day the Earth Stood Still from Twentieth Century Fox opens on December 12, 2008. “The Day the Earth Stood Still” opens with what could be a meteor speeding towards Earth. The nation’s scientists, including Dr. Helen Benson (Jennifer Connelly), are called in to deal with what they expect will be a catastrophic aftermath on its impact in New York City. Shockingly, the orb slows down and lands gently in the middle of Central Park. A creature emerges from the “ship,” and the army almost immediately opens fire. It turns out that this amorphous creature is not alone and his companion, a giant robot known as GORT, comes to his rescue, shutting down the enemy around them before the visitor can be shuttled off to safety. After shedding his alien-like skin, the extra-terrestrial turns out to be Klaatu (Keanu Reeves), an emissary from outer space who has been sent here to warn humans that our ways are leading to the brink of civilization. What ways? It could be global warming, warfare, or anything that you think might damn our race. It’s never made clear. What is clear is that Klaatu gets to determine if there’s any hope for us or if it’s time for a planetary cleansing. Klaatu is questioned and examined by Helen, her colleague Michael (Jon Hamm), and the Secretary of Defense Regina Jackson (Kathy Bates). Of course, the government has no idea what to do with Klaatu and suspect that his alien race has not come in peace. After trying to reason with them and failing, Klaatu escapes custody but is forced to reunite with Helen and her stepson Jacob (Jaden Smith), whose father recently died in battle. Jennifer Connelly stars as Dr. Helen Benson, a noted scientist who tries to unravel the mystery surrounding the arrival of an alien being. After Helen, Jacob, and Klaatu hit the road, she learns that our visitor’s true goal is to use GORT to wipe out humanity so that the Earth can start fresh. Connelly is reduced to a series of pleas for humanity’s future, Smith is given nothing to do but whine about his mean stepmom and his dead dad, and Reeves actually makes out the best by finally finding a character for which his trademark blank expression is appropriate. “The Day the Earth Stood Still” is a movie with no concrete vision, style, or purpose. The idea to upgrade a B-movie for a generation used to Steven Spielberg and Roland Emmerich alien effects is not a bad one, but director Scott Derrickson and writer David Scarpa never stopped to ask what kind of movie they were making. “Day” starts as a reasonably effective B-movie but, as soon as it tries to get serious, it completely collapses. And it’s tragically ironic that a movie based on the fallibility of humanity loses sight of its character in an increasingly CGI-heavy final act that concludes with one of the most ridiculous endings in years. ‘The Day the Earth Stood Still’ stars Keanu Reeves, Jennifer Connelly, Jaden Smith, Jon Hamm, and Kathy Bates. ‘The Day the Earth Stood Still,’ which was written by David Scarpa and directed by Scott Derrickson, opened on December 12, 2008. Submitted by Anonymous (not verified) on January 2, 2009 - 1:40am. I saw this movie last week, its good! I think Jennifer Connelly does great work in this movie. This movie make me thinks a lot about the environment. If the human keep on like this, there maybe one day the earth stool still, no matter how strong love we have with each other. In fact, there maybe a little impossible for some scientist meet the alien visitor’s favorite. I mean the profession chart a lot big human problem with the alien visitor, and at last, he help alien visitor to give the chance to the world.